Of course, the nature and source of the summons that brought the Dunedain is up for discussion, Galadriel, Gandalf, or even Elrond or Arwen, though no one seems to think of the latter two. The wisdom and sight of Elrond is well considered in other areas of the story, and not only do they come bearing a banner made by his daughter, but his sons ride as well. Gimli remarks that he and Legolas should have wished for some of their own kin, which leads me to wonder the situation within the Mirkwood. Legolas replies "I do not think that any would come... They have no need to ride to war; war already marches on their own lands." After The Hobbit a blow was dealt to the shadows that lay over the Greenwood, but it remains marked as the Mirkwood. What did his kin and lands face when he left to seek Elrond's council and join the Fellowship? The Lord of the Rings is often considered something of a bro-fest due to the strong lack of female characters even in supporting roles. 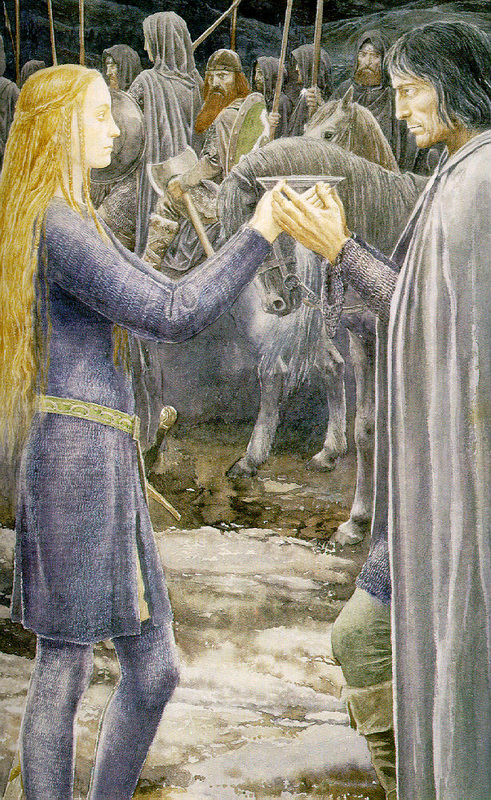 I have to say though, painful romantic pining aside, I like a lot of what Tolkien does with Eowyn here (and it's worth noting how Alan Lee also painted her as well, dressed for war not the hearth - she's made out far more traditionally feminine in the film up through here, including wearing a courtly dress in camp). Her voice is strong and powerful, calling out the role she is dealt again and again regardless of her ability to fully serve. She is right to fear a cage, that is too easily the shape her life can take. Under the ground, in a cavern even Gimli balks at entering, Aragorn, Gimli, Legolas, and the Dunedain take the Paths of the Dead, with an army of fallen gathering behind them. After the darkness of the last few chapters, and the ending of the last film, we get a celebration of the lives lost and of the lives that remain. Order has been shuffled around a little bit, as in this post-battle wake we see Merry and Pippin bringing their own joy of life to the party, and the Palantir handling does not come up for a few scenes. But more than that the overall feeling here is of hope, even with the acknowledgement of lurking shadow. Mixed in the points of this chapter is some content I've already touched on, namely dealing with Arwen and Elrond. Arwen choosing mortality and the (seriously belated and obviously aided by magic) reforging of Narsil. So moving on. The rest of this chapter has to be sought out in the film, split into several sections that seem to attempt to connect these events happening into a more linear rather than parallel narrative. The gain is more growth of Theoden as a leader and a character, the loss is deliberate planning to travel to the Paths of the Dead, instead they oddly camp at the entrance way (yes Legolas, the horses are restless), and get Aragorn staring uncomfortably down a ghostly chasm. We lose some of Eowyn's more powerful dialog, and get it reinterpreted instead instead as a defense of Merry fighting. I'm of mixed opinion regarding the dream sequence, but I suppose they wanted to loop in Aragorn as to Arwen's decision on a mystical level before he finds out from her father. I'm not a fan of some of Elrond's dialog, but I rarely fail to enjoy Hugo Weaving's delivery. My problem here is the "lets add extra drama and internal conflict" in what's a rather powerful build up regardless (plus, Aragorn should have had the sword already). Why remove the company of Rangers, the simple message of council, Arwen's gift, and instead have him almost sneak off in the night with only Gimli and Legolas for company. Again, I'm still left wondering why the hell they would camp on the edge of a place considered so cursed, but I guess it shortens travel time, and Legolas serves well to rely the otherwise expository information. Visually, the journey they make differs from what I expect based on the text, with the ruined city and it's defiant ghostly king. The brief armed stand off gives the claiming of destiny and some drama that I suppose was felt otherwise unfulfilled by a proclamation in the darkness.